King of Castile and Leon (1295-1312); son of Sancho IV. ; came to the throne in his youth. He had for his confidential friend a Jew of Andalusia, Don Samuel, who acted as his "almojarife mor," or farmer-general of taxes, and director of the royal finances, and exercised a powerful influence over him ("Chron. de D. Fernando IV." xix. 34). 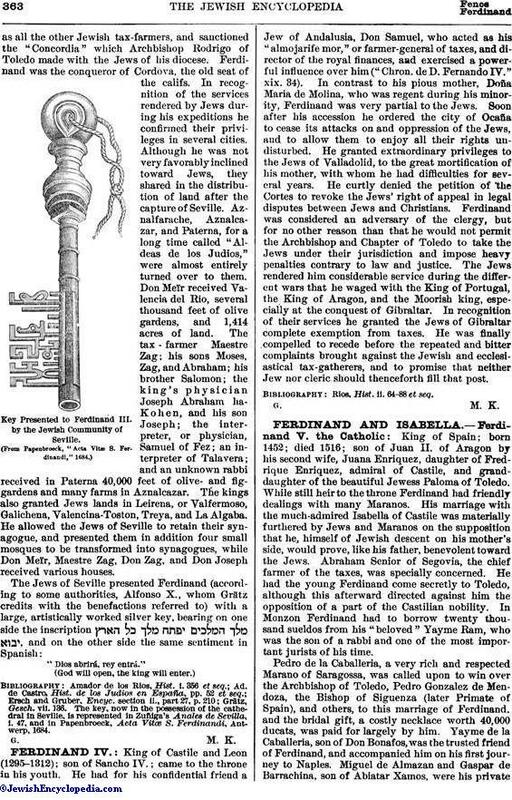 In contrast to his pious mother, Doña Maria de Molina, who was regent during his minority, Ferdinand was very partial to the Jews. Soon after his accession he ordered the city of Ocaña to cease its attacks on and oppression of the Jews, and to allow them to enjoy all their rights undisturbed. He granted extraordinary privileges to the Jews of Valladolid, to the great mortification of his mother, with whom he had difficulties for several years. He curtly denied the petition of the Cortes to revoke the Jews' right of appeal in legal disputes between Jews and Christians. Ferdinand was considered an adversary of the clergy, but for no other reason than that he would not permit the Archbishop and Chapter of Toledo to take the Jews under their jurisdiction and impose heavy penalties contrary to law and justice. The Jews rendered him considerable service during the different wars that he waged with the King of Portugal, the King of Aragon, and the Moorish king, especially at the conquest of Gibraltar. In recognition of their services he granted the Jews of Gibraltar complete exemption from taxes. He was finally compelled to recede before the repeated and bitter complaints brought against the Jewish and ecclesiastical tax-gatherers, and to promise that neither Jew nor cleric should thenceforth fill that post. Rios, Hist. ii. 64-88 et seq.